Pour chicken broth into a saucepan and bring to a simmer. Adjust heat to keep broth hot. Heat 1 T of olive oil in a large nonstick skillet over medium-high heat. Add onion and cook, stirring frequently, until translucent, about 5 minutes. Add rice and stir well to coat. Add wine and stir until liquid is absorbed. Add chicken broth, about ½ cup at a time, stirring frequently. Allow broth to be absorbed into rice before adding next ½ cup. When all broth has been added and absorbed (this should take about 20 minutes), stir in the pumpkin, nutmeg, and Parmesan cheese. Reduce heat to low. Meanwhile, heat remaining 1 T of oil in a large nonstick skillet or wok over high heat. Add shrimp and cook about 2 minute per side or until just cooked through. Season with salt and pepper to taste. 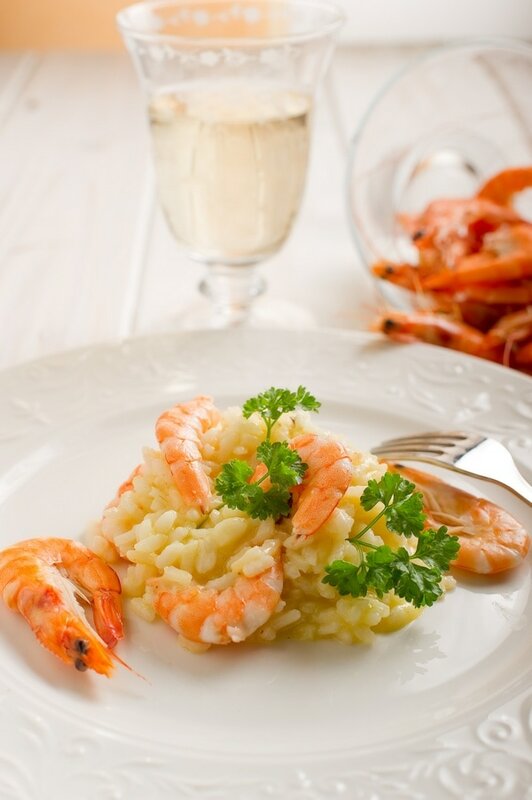 Divide risotto evenly between plates or pasta bowls and top with the shrimp. Sprinkle with parsley as desired.